If you are going to Las Vegas, then visiting a casino is a must; it’s what put this town on the map to begin with. Here you will be able to play roulette with live dealers and poker with some of the world’s best players. If you like playing, then visit the Gamblers General Store, which offers a library of gaming books to help you brush up on your skills. Looking for a show that will blow your mind? Vegas is known for the wide variety of shows you can catch all year-round. Musicians such as Jennifer Lopez, Celine Dion, Elton John, Rod Stewart and Britney Spears are just a few of the A-list stars who have performed here. There are also magic shows, comedy shows, tribute shows, and Cirque Du Soleil shows. 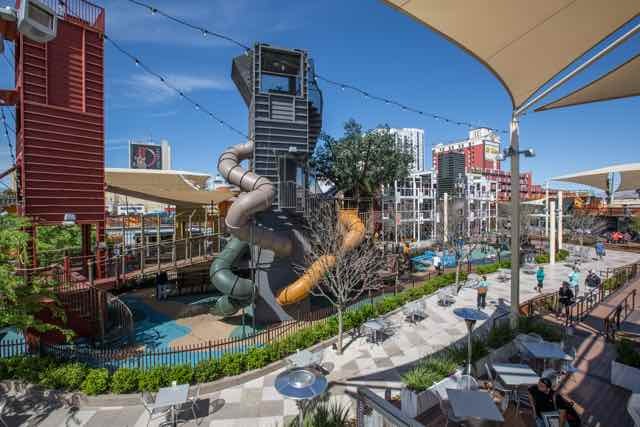 No matter what your taste may be, you will find something for everyone here.Las Vegas hotels allow you to see the world without ever leaving the city. You can visit a replica of the Eiffel Tower from Paris or the Statue of Liberty from New York. If you’ve ever wanted to know what it’s like to take a gondola ride in Venice, the Venetian is built to look just like St. Mark’s Square. Ride the gondola down the Grand Canal and stop at a secret garden that is home to white tigers. Are you seeking a thrill but gambling is not your cup of tea? Vegas offers numerous rides that will make even the biggest thrill seekers think twice. At the top of the Stratosphere hotel you will find the world’s highest amusement ride. The ‘Big Shot’ shoots you to over 1000-feet above the strip at 45mph. Have you ever wondered what it would be like to ride a roller coaster through Manhattan? The New York – New York hotel features a rollercoaster that allows you that experience. There is more to Vegas than just the strip however. The experience is just as great right outside the city. Another thing you can cross off the bucket list while here is visiting the Grand Canyon. There is nothing more breath-taking than taking a helicopter ride over one of the most beautiful natural wonders in the world. There is also the Hoover Dam, which took 5 years and 21,000 men to construct this historical structure. Seeing this 726-foot-high dam will certainly leave you with an impression. Las Vegas has successfully transformed itself from a place of gambling, partying and booze, to a city that anyone and everyone can enjoy. There is so much to do in the city now that you may not even have time to gamble.